← USA wine night: Cheeseburgers and Pinot Noir! ely are delighted to announce a sneak preview of the events pencilled in for next year! We will continue with the very successful wine evenings on Thursday nights at ely wine bar, Ely Place. All our evenings will feature a guest speaker; be it a winemaker, an importer or an wine specialist! Ticket price is €30 and includes a supper dish to match the wines. Kevin Judd, founding member of Cloudy Bay, has left after 25 years to set up his own label – Greywacke. He is one of the founding fathers of New Zealand wine and an inspiration to many winemakers, and winedrinkers(! ), around the world. He is only in Ireland on the 17th January next year and ely jumped at the chance to showcase the new Greywacke range. We will match each of his wines with a specially prepared dish from ely’s organically sourced produce. Guests will also be treated to a sneak preview of his world class Pinot Noir. Tickets will cost €69 per head. To read more on Kevin, just click here. ely’s 6 week wine appreciation course will run every Tuesday from the 18th January – 22nd February 2011. Each evening you will taste 6 wines, recieve detailed course notes and have a specially prepared dinner. 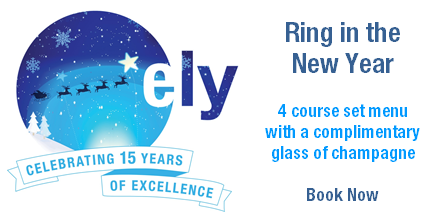 Please click here for more details on all events or email Michelle at wineclub@elywinebar.com.